Dakota is on the cover of Hunger Magazine #13! She is one of their 3 cover stars for this issue, and the other two are Elizabeth Olsen and Chadwick Boseman. You can buy the magazine with Dakota’s special cover here. 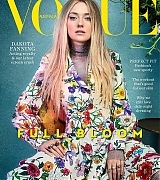 For this issue we’ve gone A-list, featuring Elizabeth Olsen, Dakota Fanning and Chadwick Boseman. Elizabeth Olsen, shot as you’ve never seen her before by Nadia Lee Cohen, turns Hitchcock heroine and discusses how society now affects her film choices and her treatment as a woman in Hollywood while Dakota Fanning, shot by Rankin, talks legacy and the need for further discussion around mental health, a subject that she delves into while filming The Bell Jar. Our third cover star Chadwick Boseman, who was shot in LA by Neil Krug, talks us through the significance of his roles in Marshall and Black Panther and breaks down the depiction of black experience in film today.